MINNEAPOLIS – Wells Fargo Bank on Tuesday presented checks worth $180,000 in grants to 17 Twin Cities-area nonprofits whose missions span a variety of focuses, from education to employment readiness training. The grants were awarded through the bank’s Community Funding Council which funds onetime, non-recurring expenses of up to $12,000 for area non-profits with a focus on leadership and career development. Joe Ravens, the Minnesota Region president for the San Francisco based bank and its senior vice-president for Community Banking said during a check presentation ceremony in Minneapolis that the bank always looks at how “we strategically impact the community,” and believes Tuesday’s funding will do exactly that. Ravens, during a question and answer session from the non-profit leaders in the room said the large employers in Minnesota, of which Wells Fargo is a part of, are keenly focused on the educational achievement gap that exists in the state. Raven sits on the board of the Minneapolis Regional Chamber of Commerce. Among the recipients Tuesday was Minnesota Kenyan International Development Association (MKIDA) which received the maximum grant of $12,000. At Tuesday’s ceremony, 17 organizations received grants ranging from a low of $4,550 to the maximum $12,000. Non-profits receiving grants through the bank’s Community Funding Council must have a minimum of three years of proven accomplishments and outcomes. MKIDA, which focuses on improving the educational, economic and cultural welfare of Kenyan-Americans in the state plans to use the funding to develop a youth career networking and mentorship program that is split into two parts, a face to face option and an online option to accommodate the busy schedules of youth and the adult mentors. The funding will also be used to build a secure website for the online mentorship and networking portion of the program. 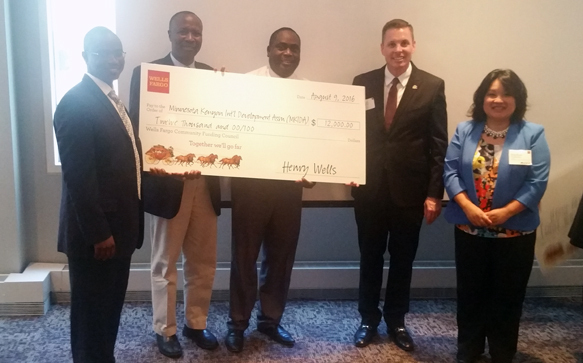 “We are grateful to Wells Fargo and its staff for this grant and for believing as we do in the community we serve. MKIDA will deliver and we look forward to serving more in our program,” said Paul Morande, MKIDA executive director, after the check presentation ceremony. With over 20,000 employees in Minnesota, the San Francisco-based Wells Fargo which has roots in the land of 10,000 lakes is the state’s third largest private employer.